Photogize EventPro is an online event and portrait commerce service for photographers and retailers. Based on the award winning PhotoCentral photo commerce site, Photogize EventPro provides unique opportunities for content publishers. Photogize EventPro provides tools for photographers to upload, aggregate and publish photos to event web sites. Furthermore, Photogize EventPro offers some unique features designed to dramatically increase viral viewing and specialty product sales. Photographers access Photogize EventPro on a Macintosh or Windows PC using their favorite browser. Photo uploads can be watermarked for security, sampled for speed, and are efficiently uploaded in batches to our world-class, tier one data center in Herndon, Virgina. Once uploaded, Photos can be edited and organized into categories and published to an event. Links to the event can then be emailed or posted to over 200 social sites like Facebook, Twitter™, and MySpace™. Consumers click the link to bring them to a Photogize EventPro site where they can view the photos and purchase prints and specialty photo products. Because Photogize EventPro is based on PhotoCentral 4, all PC4 print products, specialty products, and finishing options are available to consumers on your PRO site. Offer 8×10 prints, framed posters, keepsake calendars, or heirloom books. And fulfill them using the familiar, award-winning Photogize workflow. 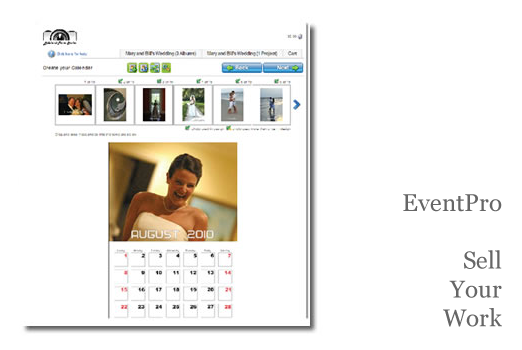 Content publishers can use Photogize EventPro to pre-create Specialty Products, like calendars, books, and Premium DVDs with the uploaded event albums. These Ready-to-Order products can be shared to the same email lists and social sites. Now consumers can purchase a calendar or book of an event with the click of a button. There is no limit to the number of specialty projects you can create, publish and sell in Photogize EventPro. Share events via or email or post event links on over 200 social sites like Facebook, Twitter, and MySpace.